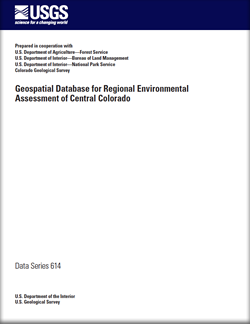 In conjunction with the future planning needs of the U.S. Department of Agriculture, Forest Service, the U.S. Geological Survey conducted a detailed environmental assessment of the effects of historical mining on Forest Service lands in central Colorado. Stream sediment, macroinvertebrate, and various filtered and unfiltered water quality samples were collected during low-flow over a four-year period from 2004–2007. This report summarizes the sampling strategy, data collection, and analyses performed on these samples. The data are presented in Geographic Information System, Microsoft Excel, and comma-delimited formats. Reports on data interpretation are being prepared separately. It is recommended to review the Readme file for database guidance. Church, S.E., San Juan, C.A., Fey, D.L., Schmidt, T.S., Klein, T.L. DeWitt, E.H., Wanty, R.B., Verplanck, P.L., Mitchell, K.A., Adams, M.G., Choate, L.M., Todorov, T.I., Rockwell, B.W., McEachron, Luke, and Anthony, M.W., 2012, Geospatial database for regional environmental assessment of central Colorado: U.S. Geological Survey Data Series 614, 76 p.